Reggae, ganja and the name of Bob Marley are, for many people, practically synonymous. The man who brought the rhythms of Jamaica and the preferred sacrament of the Rastafari movement to a grateful worldwide audience will probably never be forgotten, unless the human race ceases to plant cannabis seeds and listen to music. 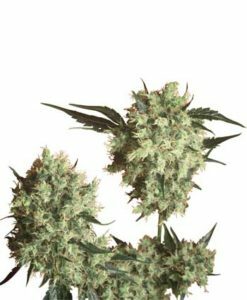 Naturally, this legendary man has his own strain of cannabis – Marley’s Collie from Sensi Seeds. This well-respected Amsterdam seed company took several years to create a strain worthy of Bob Marley’s name. Initially, a select group of tropical Jamaican Sativas were bred and refined until a suitable mother was achieved. This exceptional island lady was then pollinated by a highly potent male from the Maple Leaf Indica line, a pure Indica family from the Afghani side of the Hindu Kush mountains. The result was a mostly-sativa cannabis seed strain with a high yield and an amazing flavour that encourages repeated sampling. Marley’s Collie is wonderfully sweet, as to be expected from marijuana with a Jamaican heritage, but with a muskier flavour than pure sativas thanks to the Afghan influence. One of the best things about this best-of-both-worlds hybrid is that the high and the stone kick in at the same time, instead of the usual pattern of the indica relaxation following the initial Sativa lift-off high. This makes it ideal for watching movies or having conversations with friends, but it can be a bit overwhelming if you’ve actually got things to do. Marley’s Collie won the Dutch High Life Cup (the overall first prize in the High Life event) in 1999, which considering it was inspired by Ben Dronkers meeting Rita Marley at the Cannabis Cup in Amsterdam in 1997 is no small achievement. In 2004 a particularly fine organically grown crop of Marley’s Collie was awarded the High Life Bio Cup. Marley’s Collie is also featured in The Big Book of Buds 2, where it is praised for the “peace and awareness at once” produced by consuming it. The “Marley” part of the name is obvious – this premium marijuana was created as a tribute to the First Family of reggae – but what about “Collie”? This word was commonly used slang for cannabis in the Kingston area of Jamaica where Bob Marley spent his youth, and is almost certainly how the great man himself would have referred to his preferred smoke.